Recently, Lenovo’s website disclosed information regarding its latest notebook in the making, Thinkpad X1 Carbon Touch, which is a touchscreen Windows 8 running high end device, revealed to be released in December. The website displayed information, intending to tease the visitors by giving a product shot of the device which has its tentative date of release in December, as stated in the website. The page was later taken down which has given rise to rumors about an accidental leak. Whether, it was accidental or intentional it has definitely caught people’s attention. The website has not given much details of the product which has been optimized for Windows 8. The only information available was the month of release and the Operating System. If the Thinkpad is to take after the non-touch version, we can expect a lot of the same specifications for the touchscreen ultrabook. It has also been revealed that X1 Carbon Touch will have a 14 inch ‘HD+’ display (most probably 1600×900 and is said to support 10-finger multi touch. The touchpad gestures of Windows 8 also have been given full support. The only other information Lenovo imparted was the claim that the Thinkpad is thin and along with a carbon-fiber construction. 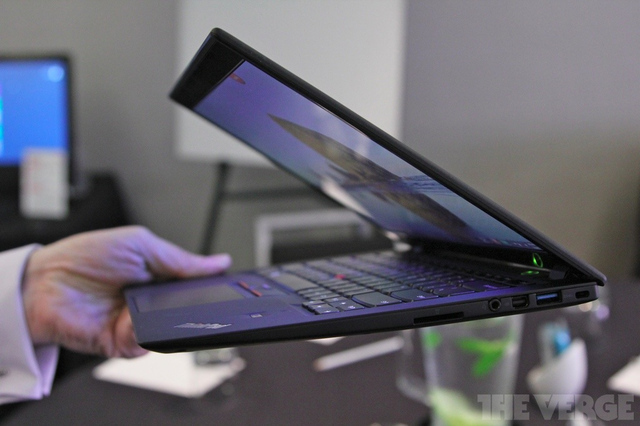 This is just like the original non-touch Thinkpad X1 Carbon ultrabook. Lenovo had claimed the non-touch version to be lightest 14 inch laptop in the world in the business class. The touchscreen Thinkpad might also put forward similar claim. Weighing under 3 pounds and 0.74 inches thick, it has Intel Core i7 processor, 128 GB or 256 GB SSD, with price range starting at $ 1,100 (Rs. 60,641).